You can click on the image above to make it larger. I'm still going through my parents home, and it's hard choosing what to keep, what to donate but there is also joy. 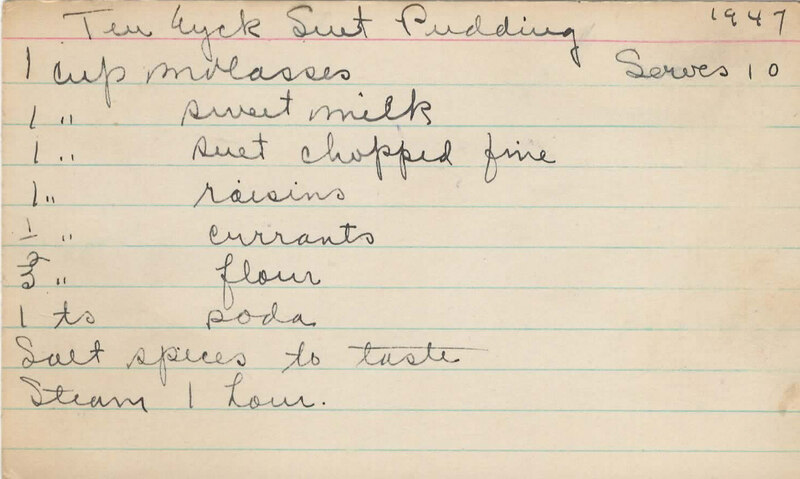 Things like finding a collection of old recipe cards. The card above is hand written by my Great-grandmother- Jane Bradley, and it's from my Great-Aunt's mother-in-law. I'm so grateful to my cousin Jane who was able to identify the handwriting. Now I know what to look for! My grandmother's typewriter and handwriting are easy for me to recognize. The history just amazes me. It's too good not to share. I've never tried this recipe, but plan to this summer. Maybe modify it with the berries I have available. Want more of my family recipes? Some of these have printable recipe cards! Grandma had a sweet tooth and loved lemon. I'll be posting more recipes later! Where does one find suet? If you have a good butcher shop locally it should be available there. It's used in some sausage recipes. You can also order vegetable suet from the UK.